The culture of the Finno-Ugrians, based on a shamanic system of beliefs of Siberian origin, has long been oppressed by the political and religious institutions of the dominant peoples of the region. Even today, the coexistence of ethnic shamanic tradition and majority culture causes political problems. Mordvin, Mari and Udmurt ethnofuturists are suspect because of the fear that they may trigger separatist movements. However, in Russia there have been a few exponents of the literary and artistic world who have shared shamanic beliefs. In the present Finno-Ugric cultural context, there still survives remarkable evidence of traditional concepts, which, like a genetic code, reflect ancient wisdom handed down by shamans. This is devoid of political interests, and helps people to overcome their difficulties. The popular shamanic conception of human life, as well as of history, as an initiatory path of renovatio, is based on the defense of ethical values, which are of particular current significance, including respect for the ecosystem and natural products. Today, Siberian shamans, masters in the fight against the conflicting forces of evil, are struggling against uncontrolled industrialization. There is a notion, in popular beliefs as well as in academic works by historians and anthropologists, that Turkic peoples had in their common past a developed religion with an established pantheon, along with cosmogonic and cosmological concepts. This article is an attempt to address this problem from an etymological point of view: what common concepts and themes can be reconstructed for the Proto-Turkic language, using the lexical data of Turkic languages and written monuments? The Wirikuta valley is located in the state of San Luis Potosí, in north-central Mexico. It is a sacred territory for the Huichol population and culture, not only for its long history, but also because of its active role in the expression of their religion through a particular shamanic practice, one that is immersed in a dynamic syncretism with the popular Christian spirituality. The Huichol (Wixaritari) tribe is best known for its traditional medicinal practices and rituals involving the use of peyote (Lophophora Williamsii), a hallucinogenic cactus native to northern Mexico and the southern USA. In this desert land a constant exchange of gifts for the peyote spirit takes place; nevertheless, contemporary Huichol religious practices maintain a significant relationship with Christian popular practice. Moreover, the increasing and constant presence of globalization has deeply marked the Huichol population, triggering conflict situations as a result of foreign predation in the region. In this context, the global dynamics in the twenty-first century take on a negative role for the Huichol, particularly since these parameters have contributed to the invasion by foreign mining corporations throughout the Huichol land, with the Mexican government selling sacred and ancestral territory, resulting in the displacement of the Huichol population. The paper is devoted to the reconstruction of the mythic-poetic worldview of the Nanay, in terms of underlying shamanic worldviews. Since Neolithic times (about 10,000–13,000 years ago), the Lower Amur region has become a territory for the syncretism of eastern Siberian and Pacific-coast traditions. The Tungus migration and trading relationship between the Amur peoples and China is reflected in the Nanay picture of the world, which includes the local worldview and various cultural elements. The tree of life, the patrons of the taiga and water powers became the main anthropomorphic or zoomorphic elements, in the form of the taiga predator and the dragon. During the Soviet period, the sacred space of the Nanay was transformed through the eradication of shamanism, and the loss of the function of many natural objects. Today in Equatorial Guinea, the world of spirits – of the dead or non-human entities – constitutes one of the main aspects in the field of the occult. The belief in spirits is something shared by the population in general, but there are specialists, mainly nganga (healers or shamans), who understand the spirits within a complex esoteric dimension, which includes knowledge as well as a whole range of practices that are made manifest especially during the diagnosis and treatment of diseases. In this article, I will present results from fieldwork carried out in Equatorial Guinea over recent years. I will focus on the conceptualization of the spirits among the Fang, the type of relationship that is established between traditional healers and these spiritual entities, how they are invoked, and the specific role that they have in therapeutic practices. This paper discusses the ethnoesthetics of the shamanic folk performance padayani in Kerala. It is also called padeni, from the Malayalam word for military formations. Padayani is a ritualistic art form performed in the sacred groves of the Pathanamthitta district, which is situated in the central part of Kerala. It is a form of folk theatre dedicated to the primal goddess. The story most commonly dramatized in a padayani is the scene after the annihilation of Darika (Demon God), when Kaali (Mother Goddess) sets out on her journey to Kailasa (Mount Kailash). To make Kaali sober and calm, Subramanyan, the son of Shiva, and the boothas (assistants to Lord Shiva) in different forms of kolam (big head-gear with masks) make up a procession in front of her. A procession of pakshikkolam, yakshikkolam, maruthakkolam (masked performance of birds and goddesses) is presented to her, during her journey, to appease her; figures are drawn on the sheaths of an areca palm in vibrant colors and there is much musical extravaganza. Figures are drawn in natural colors in which the enlarged shape of the eyes in the night light glitter and seem to project up. This shaman’s performance begins after the harvest with elaborate rituals. Each day includes diverse masked performance than contain a number of magical songs, which have very strong rhythmic beats that are played on a musical instrument (thappu). The whole village participates in this ritual. The sacred thottam pattu (ritualistic melody) is sung as part of padayani performance. 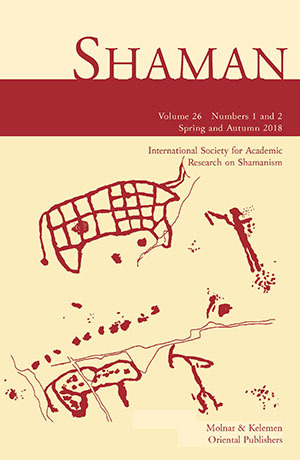 This article is based on the materials collected by the ethnologists Vilmos Diószegi (of the Hungarian Academy of Sciences) and Feofan A. Satlaev (of the Soviet Academy of Sciences) from the Siberian Turkic Kumandy on a joint field trip in August, 1964. Diószegi was the first Hungarian ethnologist to have undertaken fieldwork in Siberia during Soviet times. Diószegi had previously conducted fieldwork in Siberia among Western Buryat, Khakas, Tuva and Tofa in 1957–8, before his final fieldwork in the Altay Republic among the Altay-kizhi and Telengit and Kumandy in the Altaiskii krai. Satlaev, himself a Kumandy, took Diószegi to his home area along the Biia river, where they collected texts from three shamans. During the two-week field trip they collected folklore texts mainly on shamanism and native religion. Later Satlaev typed up the Kumandy texts and sent them to Diószegi. Diószegi died in 1972 and the material remained unpublished, even though there is valuable information on Kumandy shamanic traditions, on how the shaman’s soul traveled to the Lower World to find ürkken jula (runaway soul), to be found among these items. Data are also provided about various spirits, such as šalıg (protector), elči (messenger), ee /ē/ (master spirit), aza (demon), and as well as tayılga (sacrifice) and the kočo ritual. The present article is a short introduction to this valuable material, which is now kept in the archives of the Institute of Ethnology, The Research Center for the Humanities (Hungarian Academy of Sciences).